Imagine beginning 2019 with a romantic getaway to the lush Willamette Valley of Oregon. 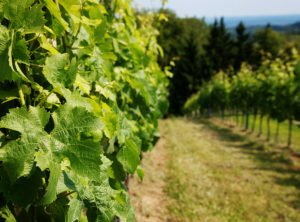 Spend your days touring and tasting the bounty of the Yamhill County vineyards. Sip award winning Pinot Noir, all the while enjoying views of the stunning countryside, peaceful valleys, distant mountains, and shimmering lakes. In addition to superb wine, visitors have an excellent choice of romantic restaurants in which to dine, and quaint towns to explore. When it’s time to put your feet up for the evening, return to the serene settings offered at our Bed and Breakfasts. The Bed and Breakfasts of Yamhill County have over 20 inns to choose from, all with their own unique character. Find your perfect getaway, and plan a romantic escape to Oregon’s beautiful wine country today. It can be a daunting task to plan an itinerary that will allow you to taste a variety of the world-class wineres found here in the Willamette Valley. After all, there are over 300 wine tasting rooms to choose from. However, planning a route by each region will help make the most of your visit. Each of these routes is a treat and offers scenic views along the way, but the Dundee Hills and Chehalem Mountains vineyards are especially scenic. While driving through Dundee Hills, stop at Winter’s Hill Vineyard, Archery Summit and Domaine Drouhin for sweeping hilltop views from their tasting rooms. The neighboring Bergström Wines, Elk Cove Vineyards and Ponzi Vineyards also offer beautiful mountain views. Of course exploring any region in the Willamette Valley will lead to a romantic adventure and great wine. The Cherry Hill Winery has a beautiful 150-acre estate with a small lake, offering lovely views from the tasting room. 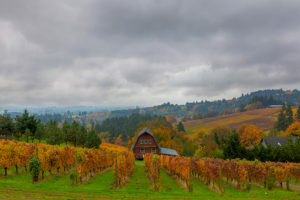 While Marks Ridge Winery offers a panoramic vista from its location tucked in the foothills of the Cascades. 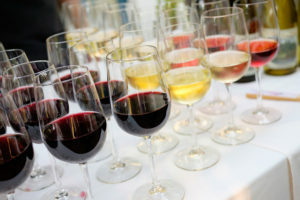 Many wineries also pair their fabulous whites and reds with small bites or even full meals. Additionally, the valley’s charming towns and tucked away locations include award winning restaurants and casual cafes. Find an intimate place for dinner, and you’ll have yourself a perfect way to complete a day in the idyllic countryside of Willamette Valley. Share the Love – Winter’s Hill Winery has partnered with 10 other area wineries in the month of February to offer a club membership to all. Valentine’s Fondue – Pair your wine flights with a savory cheese fondue at Winter’s Hill Winery this Valentine’s weekend. Winter Wine Dinner Series – Lange Estate Winery & Vineyards partners with master Northwest chefs and pairs their Pinot Noir, Pinot Gris and Chardonnay with the perfect cuisine. ROCO’s Perfect Pairings – ROCO Winery hosts this tasty and informative event where guests experience matching the ideal cheese with their exceptional wines. Valentine’s Day Dinner – Solena Winery hosts the talents of local chef, Skyler Smith, and his magnificent 6 course dinner to tempt any palate. 8th Annual Valentine’s Wine Tasting Loop & Book Signing – Alloro Vineyard is bringing love of Pinot Noir together with the passion for wine making. Join them this February for a night of special flights and author, Kenneth Friedenreich, with his book Oregon Wine Country Stories: Decoding the Grape. This is just a small sample of what the Willamette Valley offers. The excellent wines, stunning landscape, and charming Bed and Breakfasts will have you returning time and time again. The Oregon Wine Inns association has members with Bed and Breakfasts covering all of Yamhill County in Oregon’s largest wine region. Browse the diverse inns and pick your perfect match for a romantic, wine tasting escape today.